Preprints (earlier versions) of this paper are available at http://preprints.jmir.org/preprint/1904, first published Aug 12, 2011. Background: Several obstacles prevent the adoption and use of personal health record (PHR) systems, including users’ concerns regarding the privacy and security of their personal health information. Objective: To analyze the privacy and security characteristics of PHR privacy policies. It is hoped that identification of the strengths and weaknesses of the PHR systems will be useful for PHR users, health care professionals, decision makers, and designers. Results: The search of databases and the myPHR website provided a total of 52 PHR systems, of which 24 met our inclusion criteria. Of these, 17 (71%) allowed users to manage their data and to control access to their health care information. Only 9 (38%) PHR systems permitted users to check who had accessed their data. The majority of PHR systems used information related to the users’ accesses to monitor and analyze system use, 12 (50%) of them aggregated user information to publish trends, and 20 (83%) used diverse types of security measures. Finally, 15 (63%) PHR systems were based on regulations or principles such as the US Health Insurance Portability and Accountability Act (HIPAA) and the Health on the Net Foundation Code of Conduct (HONcode). Conclusions: Most privacy policies of PHR systems do not provide an in-depth description of the security measures that they use. Moreover, compliance with standards and regulations in PHR systems is still low. In many countries, it is tedious for patients to obtain copies of their official health records from health care providers, which makes it difficult for patients to seek second opinions or control their own information . Moreover, records that patients create themselves tend not to be included in the official patient record. A personal health record (PHR) system can be maintained by patients and their families, can be shared with clinicians, and can support the maintenance of accurate and complete health records . A PHR is “an electronic record of an individual’s health information by which the individual controls access to the information and may have the ability to manage, track, and participate in his or her own health care” . A PHR should include all relevant information about the user’s life, including the following items: problem list, procedures, major illnesses, allergy data, home-monitored data, family history, social history and lifestyle, immunizations, medications, laboratory tests, and genetic information [3-5]. A PHR can take multiple forms: an independent software application running on a single computer; a Web service belonging to a single organization; a general Web service as a platform with which to collect different types of health information; or a USB-based PHR [6,7]. Maintaining data privacy is difficult in both PHRs and electronic health records (EHRs) , to the extent that, for instance, administrative staff could access information without the patient’s explicit consent . Consumer concerns regarding PHR systems were found to be focused on two major areas: privacy and security . A total of 91% of surveyed Americans stated that they were very worried about the privacy and security of their health information [7,9]. The aim of this review is to answer the following research question: What security and privacy features do PHR systems have? We carried out an in-depth analysis of many significant issues related to the security and privacy features of PHR privacy policies. The data collected were contrasted by analyzing the privacy aspects of 50% of PHR systems. The methods used to carry out the review were guided by a protocol. Iterative decisions concerning data collection, fields for extraction, analysis, and other relevant aspects of the survey were discussed in meetings that were attended and documented by the authors. This review followed the quality reporting guidelines set out in the Preferred Reporting Items for Systematic Reviews and Meta-analyses (PRISMA) statement . Based on the International Organization for Standardization (ISO) standard ISO/TR 12773 (Business Requirements for Health Summary Records), a PHR is defined as an electronic, universally available, lifelong resource of health information maintained by individuals, as opposed to an EHR, which is a repository of health information gathered across the longitudinal electronic record of the patient. This information is generated by one or more encounters in any care delivery setting . Among the current variety of PHR support technologies, we focused our study on Web-based, free PHR systems. Free PHR systems can be used by anyone and are easiest to access (IC1). Web-based PHRs have certain benefits with regard to the use of the Internet (IC2) . Moreover, the US Institute of Medicine recommended that “access to care should be provided over the Internet, by telephone, and by other means in addition to in-person visits” , while the 2003 Health Information National Trends Survey indicated that consumers use the Internet to access health information more often than they obtain this information from their health care professionals . In addition, the number of users who use the Internet to access and manage their PHR is increasing [14-18]. Finally, according to the ISO, the owner of the record in a PHR system can be the health care organization, provider, or patient . We also stipulated that the PHR systems included in the review should be patient-centered applications—that is, according to the definition of a PHR in the Health Insurance Portability and Accountability Act (HIPAA) , the information should be totally or partially managed by the patient (IC3). We analyzed this type of PHR system because they are more flexible and useful than non-patient-centered PHR systems, although they can have more privacy and security problems. We used two information sources: the myPHR website and scientific databases. The myPHR website was created by the American Health Information Management Association and contains information related to the use and creation of PHRs. To the best of our knowledge, this website provides the most comprehensive list of PHR systems that a user can find and has also been used to select PHR systems in multisource sampling . Although our primary source was myPHR, we identified other PHR systems by reading articles extracted from the Medline, ACM Digital Library, IEEE Xplore Digital Library, and ScienceDirect databases, which we searched between February and April 2011. A systematic review was then used to review the articles indexed in these databases. 1. The search for PHR systems from the myPHR website. 2. The search for PHR systems from scientific databases. This phase was performed by means of a systematic review with the following search string: (“PHR providers” OR “Microsoft HealthVault” OR “Google Health”), which we adapted to database search engines. We next explored the articles identified in order to find the names of Web-based PHR systems. 3. Exploration of the PHR systems found, and a selection based on eligibility criteria IC1 and IC2. 5. A complete reading of each of the PHR privacy policies selected in the previous phase to extract their principal privacy and security characteristics. In this study, we analyzed security and privacy of PHR systems in reference to the ISO 13606 standard . Security was analyzed in terms of availability, confidentiality, integrity, and accountability. According to the ISO 13606 standard (Electronic Health Record Communication Part 4: Security), availability refers to the “property of being accessible and useable upon demand by an authorized entity.” This standard defines confidentiality as the “process that ensures that information is accessible only to those authorized to have access to it.” Integrity refers to the duty to ensure that information is accurate and not modified in an unauthorized fashion. Accountability refers to a person’s right to criticize or ask why something has occurred. The other topic analyzed in this study, privacy, has been defined as “the claim of individuals, groups, or institutions to determine for themselves when, how, and to what extent information about them is communicated to others” . The characteristics analyzed in the privacy policies allowed us to analyze how privacy, integrity, and confidentiality are maintained. We designed a template for the data to be extracted from each PHR system. In total, 39 characteristics were analyzed and grouped into 12 categories, which we divided into privacy, security, and standards and regulations. Table 1 shows the category descriptions. Some of the characteristics are dependent on others. A complete list of the characteristics analyzed is described in Multimedia Appendix 1. Table 1. Description of the assessed personal health record (PHR) system characteristics. Each of these categories satisfied one or more of the eight principles concerning privacy policies by the Canadian Standards Association . The categories, and the principles that they satisfy, are shown in Multimedia Appendix 1. The test-retest  method was used to measure the reliability of the measuring procedure. The same test was performed on the same PHR systems after a month. We obtained a correlation of 0.96 between the scores in the two assessments. We identified 24 PHR systems in the review. 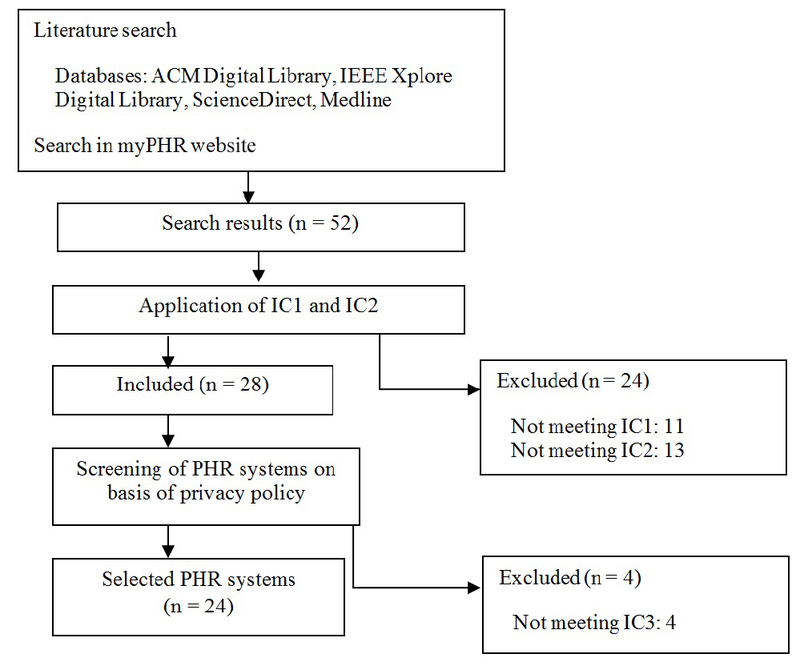 The search of databases and the myPHR website provided a total of 52 PHR systems, but we discarded 11 because they did not satisfy IC1 and 13 because the did not satisfy IC2. The privacy policies of the remaining 28 PHR systems were examined, and 4 of these were discarded because they were not patient-centered PHR systems (IC3). Figure 1 shows a PRISMA flow diagram that summarizes this process. The PHR systems included in and discarded from the review are shown in Multimedia Appendix 2. Figure 1. Preferred Reporting Items for Systematic Reviews and Meta-analyses (PRISMA) flow diagram. IC1–3 = inclusion criteria 1 to 3, PHR = Personal Health Record. In this section, we describe the most important features of the PHR systems included in the review. Table 2 shows the percentage of PHR systems that satisfy each characteristic analyzed. Table 3 [28-51] shows the systems selected for the study and the three scores assigned to each: security score, privacy score, and total score. More detailed information about the PHR systems analyzed is provided in the tables shown in Multimedia Appendix 3. The percentages and the scores of the dependent characteristics were calculated in relation to the number of PHR systems that met the nondependent characteristic. a Health Insurance Portability and Accountability Act. b Health on the Net Foundation Code of Conduct. Table 2. Evaluation of personal health record (PHR) system characteristics and proportion of PHR systems (n = 24) satisfying each characteristic. a Maximum possible scores: 14 (security score), 8 (privacy score), 24 (total score). Table 3. The personal health record (PHR) systems and their assigned scoresa. Only 5 of the PHR systems reviewed defined kinds of permissions. The Google Health PHR system  determined two access types for services or applications: write-only access and read/write access. The RememberItNow! PHR system  defined three kinds of accesses: write, read, and administrator. Microsoft HealthVault  established access levels for users and programs. The Healthy Circles PHR system  defined read permission and read/write permission. PatientsLikeMe  allowed the contents to be public (anyone could access them) or visible (only PatientsLikeMe users could access them). Finally, only 6 PHRs considered data access in case of an emergency. This access could be total  or partial . PHRs contain information users’ personal data, which are managed by the user in 20 of the PHRs reviewed. However, MyChart indicated that its users could not manage their own data . Users could only notify the associated health care providers of incorrect data, but not modify them. MyChart was responsible for managing the data. The remainder of the PHR systems did not indicate whether users could manage their data. A total of 12 PHR systems used aggregated information about users to publish trends or to improve their services [29,30,32-34,37,38,40,41,44,46,48]. Of the PHR systems reviewed, 3 could access users’ identifiable data without their consent [39,45,47]. One mechanism that allowed users to verify whether data confidentiality and integrity were maintained is access audit. In this respect, 9 of the PHR systems permitted users to check who had accessed their data [28,30,32,34,36,38,47,49], and 2 of them allowed users to verify what changes were made [28,30]. PHR systems also presented security measures to maintain data integrity and guarantee confidentiality. Of the PHR systems reviewed, 20 indicated whether they used physical or electronic security measures: 15 of them used physical security measures in their servers. On the other hand, we found 12 PHR systems that used encryption to protect the data during transmission [28,30,32,35,36,38,40,43,46,50], and 4 also stored the data encrypted [35,36,43,46]. And 1, ZebraHealth , stated that they regularly reviewed and revised data security plans as required by the evolution of technological and security needs. Some PHR systems even had a privacy seal: Microsoft HealthVault, Healthy Circles, Juniper Health, and dLife were certified by TRUSTe . To avoid unauthorized access of users’ records, an authentication system is required. The most widespread authentication system was the combination of a user ID with a password, which is something the user knows [28-51]. Some PHR systems combined this with the use of an activation code that had been given to users previously [37,47,48,51]. Only 1 PHR used something the user has for authentication. To access MedsFile.com , users had to enter the personal identification number on their access card. As for the access criteria, the most common one was role-based access control [29,31,32,34,36,39,40,42-44,47,48,51]. PHR systems allowed patients, health care providers, insurances, companies, etc, to access records. Access criteria based on location were applied by 1 PHR . This PHR changed the data shown, such as the list of health care providers, depending on the country from which the user accessed the system. Moreover, 2 PHRs enabled users to establish a period of validity for permissions, which were revoked once this period expired [28,38]. The main characteristics of the PHR systems reviewed are summarized below. These characteristics answer our research question of what security and privacy features PRH systems have. What Security and Privacy Features do PHR Systems Have? With regard to PHR access management, 71% of PHR systems allowed users to grant and revoke access to their data. This characteristic is particularly important because users require more flexible ways of sharing data, allowing the user to choose who can access their data, which data they can access, and at what level of access . A problematic issue is the access to users’ data in case of emergency—that is, when users cannot explicitly grant access. We found that 35% of PHRs considered this case and provided some type of mechanism to permit the appropriate health care professionals (previously authorized by the user) to access the user’s data. Some PHR systems, such as Microsoft HealthVault, allowed users to select what information could be shared and with whom in case of emergency. Nevertheless, emergency access increases the risk of data breaches. Some national laws assume implicit patient consent in an emergency situation , which does not guarantee the privacy of patients’ data. Moreover, this unusual access adds an extra complexity level to the access control model . On the other hand, not all users are very inclined to share their data in a health emergency. Users with good or excellent health are less likely to share their data during this kind of situation . We examined patient-centered PHR systems in this review, and they allow users to manage their data. In other words, users can add, modify, remove, and update their health data in 83% of cases, according to our review. Connecting the PHR to the EHR would lead to more comprehensive data management by patients . However some physicians have expressed their concern about giving patients so much control over their records, because the information stored in PHRs might be less accurate if patients do not know what exactly is included in them, in comparison with non-patient-centered PHRs . Moreover, if a PHR is hacked—and the patient’s data are modified—then, physicians cannot be sure of the correctness of the data . When information comes from several sources, greater privacy and security risks emerge. However, determining the most appropriate strategy remains an open question: to have multiple reliable sources of information, or to have the patient be the only information source. Few PHRs permit users to check who accessed their data. This aspect should be improved because, according to HIPAA’s Privacy Rule and Security Rule and to ISO 13606, users should be aware of how their information has been shared. We found that 3 (13%) of PHR systems used information related to users’ accesses and identified user information to monitor system use without the user’s explicit consent. Since the users’ privacy should be guaranteed, their identifiable information should not be accessed without their consent . Half of the PHR systems used de-identified or aggregated user information. However, it is very difficult to retrieve sufficient information when aggregated data are used in order to ensure that patients cannot be identified, so some risk of re-identification will usually remain [8,65]. A further issue is that PHR privacy policies did not indicate what information they aggregated. PHR designers could consider studies such as that of Sweeney, who designed a model called k-anonymity, and the accompanying policies that allow the individual’s information to be protected, because this cannot be distinguished from, at least, k - 1 other individuals’ information . With regard to the information de-identification process, HIPAA indicates that there are two ways to do this: a formal determination by a qualified statistician, or the removal of specified identifiers of the individual and of the individual’s relatives, household members, and employers. Removal of identifiers is adequate only if the entity covered has no actual knowledge that the remaining information could be used to identify the individual. In any case, one of these two means is required . The PHR systems must take physical and electronic measures to protect user information . Of the PHR systems we analyzed, in their privacy policies, 63% indicated their physical measures and 67% explicitly stated their electronic security measures; however, only 4 (17%) stated that the data were encrypted both for transmission over the network and for storage. The most widely used encryption scheme for communications was secure socket layer. However, encryption is only part of the solution to protect data. There are also other threats, such as virus-infected systems, against which the PHR systems must be protected. Although there are no well-documented examples of EHR/PHR systems linked to security breaches , designers should consider threats to Web applications at least when they deploy their PHR system. In 2008, over 63% of all documented vulnerabilities affected Web applications . Important for security vulnerability is authentication . All the PHR systems we analyzed used only one authentication method, the use of something the user knows or has. However, two of the following three methods are recommended for inclusion in an identification system: something a person knows, such as login ID; something a person has, such as an access card; or something that identifies a person, such as biometrics. Therefore, designers should incorporate another authentication system to strengthen authentication . Moreover, the use of passwords as an authentication mechanism is exposed to multiple types of attacks, such as electronic monitoring of network traffic to capture information, or unauthorized access to the password file. Finally, 38% of the PHR systems used cookies to remember that the user had already logged in. Using cookies increases the likelihood of identity attacks because the cookie’s authentication data can be intercepted by a hacker to gain access to the user’s health data . Finally, less than half of the PHR systems we reviewed were based on standards or regulations, and this shows that there is no guarantee that the privacy and security of patients’ data is ensured. The most frequently referenced regulation is HIPAA, used in the United States. HIPAA is a federal law that protects health information and ensures that patients have access to their own medical records while assigning new responsibilities to those in charge of protecting this information. Although PHR systems are not required to meet HIPAA by law, users might believe that their data are better protected if the PHR satisfies HIPAA . This study had several limitations. Although we conducted a comprehensive literature search on numerous databases using a variety of pertinent search terms, certain PHR systems may have been overlooked due to the lack of indexing in the searched databases. In addition, we recognize that several key PHR systems that were included in the original sample of 51 were excluded as a result of selection criteria. Moreover, we may have excluded some PHR systems if we did not find their privacy policies on their website. Since this study only analyzed the security and privacy characteristics of PHR systems, it lacks information about the users. Our results cannot easily be generalized to populations, since PHR systems are not equally used by people of different age groups. The scope of this study did not include analysis of real functionality of PHR systems, and some PHR systems may not satisfy their own privacy policies, so incorrect data may have affected the results of the study. However, this limitation is diminished because we cross-checked the results against an evaluation of actual functionality of 50% of the PHRs. Another limitation of our study is related to third-party access to the PHR. This characteristic turns PHR systems into a more flexible tool, although it would be necessary to analyze the privacy policies of these parties. In general, PHR systems allow users to manage their personal health data and to control who has access to them. However, there is a debate regarding the degree to which individuals should be able to control this access, and the forms that this control may take: some PHR systems allow their users only read-only access, while others offer individuals total control [73,74]. The strengths and weaknesses in the privacy and security of PHR systems will be useful for PHR users, health care professionals, decision makers, and system builders. In accordance with the privacy policies, PHR systems do not provide an in-depth description of the security measures used. The designs of privacy policies also need to be improved to include more detailed information related to security measures, and PHR system designers should focus their efforts on increasing the quality of security measures at all stages of system development . The use of standards and regulations by PHR systems is still low. The majority of companies that design PHR systems are not covered by HIPAA . This may be one of the reasons why users do not use PHR systems . Finally, the development of third-party applications that add new functionality to PHR systems is increasing. An example of this is Microsoft HealthVault, which has more than 50 third-party applications . This connection to other applications, such as PHR systems, could also cause important security breaches. This work has been partially financed by the Spanish Ministry of Science and Innovation, project PANGEA, TIN2009-13718-C02-02. Characteristics analyzed and principles that they satisfy. List of personal health record systems excluded and included in the study. Characteristics of personal health record systems included in the review. Yee G, Korba L. Personal privacy policies. In: Vacca JR, editor. Computer and Information Security Handbook. Amsterdam: Morgan Kaufmann; 2009:487-505. Westin AF. Privacy and Freedom. London: Bodley Head; 1970. Denzin NK. Sociological Methods: A Sourcebook. New Brunswick, NJ: Aldine Transaction; 2006. Carmines EG, Zeller RA. Reliability and Validity Assessment. Thousand Oaks, CA: Sage Publications; 1979. ©Inmaculada Carrión Señor, José Luis Fernández-Alemán, Ambrosio Toval. Originally published in the Journal of Medical Internet Research (http://www.jmir.org), 23.08.2012.